'SWEATSHOP UNION' Live In Concert. PLUS JUST ADDED: Special KYPRIOS solo set alongside guests The Pocket Kings and DJ Speedyshoes. Sugar Nightclub - 858 Yates Street, Victoria. 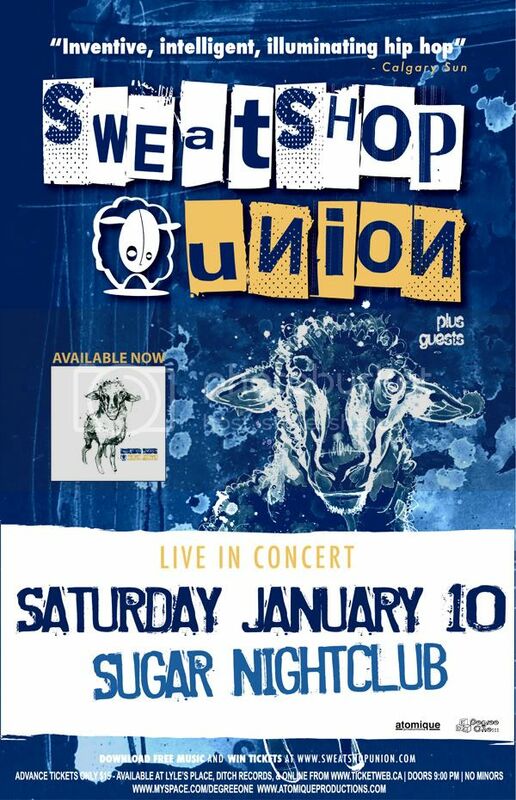 Sweatshop Union are rapidly becoming known for their distinctly musical conscious hip hop and a live show far beyond the average rap concert. With tens of thousands of sales of their critically acclaimed albums, Sweatshop have toured relentlessly with the likes of the Black Eyed Peas, Jurassic 5, Blackalicious, De La Soul, Swollen Members and the Living Legends, building a dedicated following. Sweatshop Union are on the rise in the '09. Sweatshop Union is a Canadian hip hop collective formed in 2000 when four politically-minded rap acts – Dirty Circus, Creative Minds, Innocent Bystanders, and solo artist Kyprios – came together "to create a powerful, distinctive voice", and to produce their first album in 2001. Signing with Battleaxe Records in 2002, their self-titled debut album was re-released as 'Local 604'. Their 2004 album 'Natural Progression' led to a Juno nomination and three Western Canadian Music Award nominations. They have been called part of "Vancouver's hip-hop renaissance", and had their music featured in CBC Radio's "Make Some Noise" documentary. In 2007 SSU expanded their touring to include dates on the East Coast and throughout the US, steadily building a strong N.American fanbase. Known for an inventive and socially-conscious sound, Sweatshop Union's music focuses on being "honest" — commenting on issues ranging from the War in Iraq, the plight of the poor and working-class, to the negativity and misogyny of mainstream hip-hop.The band's most recent album, 'Water Street', was released in 2008 to rave reviews. No Minors. 2 Pieces of ID Required.